MY FOODIE SELF: Turkey is meat for vegetarians! Get a GOOSE! This is the place for my activities (shopping, growing, collecting, cooking, preserving, eating-out) and thoughts around good food. Turkey is meat for vegetarians! Get a GOOSE! Now, since it's Thanksgiving and people out there are done driving their turkeys aroun the block before roasting them for hours on end I'd like to post my own personal opinion on that white fleshed bird: Turkey is meat for vegetarians. It tastes like rice crackers, is dry as bone and the color of the meat is closer to paper than to a muscle. Never, never, never will it enter my kitchen! - I'd rather have a tofu "steak" than turkey. Enough of the bashing - what alternatives are there? Well, if you need to feed a hungry bunch and want to taste real poultry beyond chicken and are not quite happy with that lame ol' duck - get a goose and make your dinner guests happy! "Bratschlauch" XXL - That's a roasting "tube" (or bag) sold per meter here in Germany. Wash the goose on the inside and outside and cut off any fat. Spice it with salt, pepper, majoram (inside and outside), stuff it with 2-3 apples (not too sweet). Tie the legs and wings close to the body and slip the bird breast-down into the "Bratschlauch" and tie that up. poke 3-4 small(!) holes so that hot air can escape. Place on a baking tray that is capable of holding a good amount of juice(the deepest one you can find). 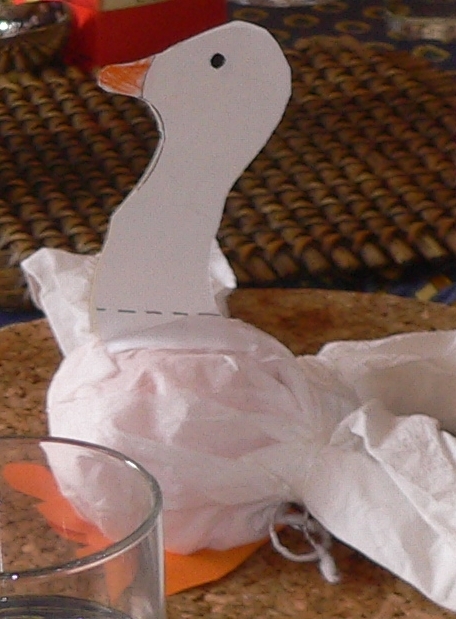 Put the goose into the preheated oven at 160°C = 320°F. The bird will stay in there for about one hour per kg (30 min per pound). Note: Keep the the FAN of you oven OFF! 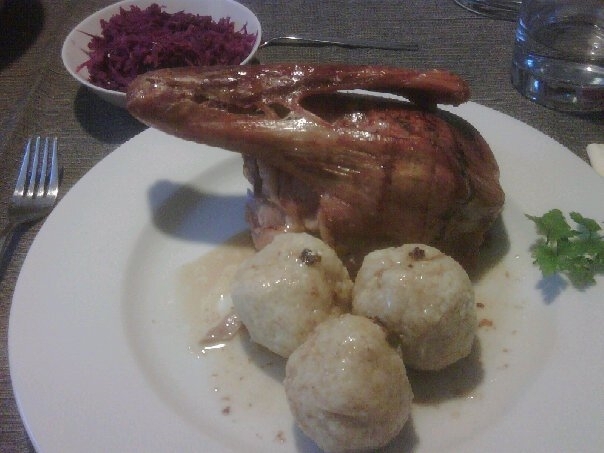 After 2/3 remove the "Bratschlauch" and carefully turn the goose upside down (breast up). Remove a good part of the juices and use for serving and fine-tuning the red and white cabbages.